I saw a 3 pound bag of apples for $1 at the farmer’s market. One dollar! I didn’t even know what I was going to do with it. Apple pie, apple cake, doughnuts, fresh cider, apple crisps, the options are endless, and it didn’t matter because it felt like it was basically free. Sometimes, you just feel like a winner and yes, it is that easy to make my day. I decided on apple sauce because Lon loves apple sauce, but that was just too easy. I had to make it special. Cinnamon, ginger, all spice, nutmeg would all be old news, good news, and he wouldn’t complain, but I just wouldn’t be completely satisfied. That’s when I took a sip of my tea, while the scent from peeling apples was wafting around me, and it hit me, Earl Grey Apple Sauce. I itched until the apple sauce was done and with one taste I knew, I just won again! I’m on a roll! 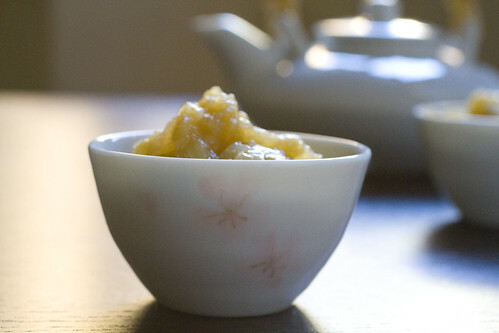 It’s Earl Grey perfumed apple sauce, and it’s wonderful. I had it on some yogurt this morning and I ate tons by itself last night. Put it on vanilla ice cream or smother it onto pork chops. Honestly, I don’t even know what kind of apples were in my 3lb bag. I think it was a mix and you can use whatever type you like, but the amount of sugar and water needed will vary by apple type so just use this recipe as a guideline, and then you can adjust at the end. 1. Stir together apples, water, sugar, and salt in a medium pot. Bring to a boil. 2. Add tea bag, making sure it is submerged in the water. Turn down to a simmer, cover and cook for 15 minutes, stirring occasionally. Un-cover and continue to simmer for another 15 minutes. 3. Remove the tea bag and discard. 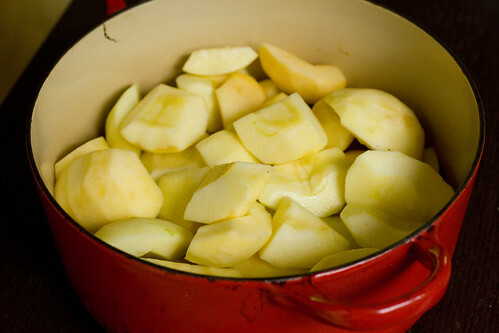 Mash apples in the pot with a potato masher for chunky, or place in a blender for a smoother apple sauce. You can add water or cook off more liquid, depending on your preference. You can also adjust the sweetness to your preference. Serve warm or cold. posted by jessica	at 10:08 AM	Filed under Desserts, Recipes. You can follow any responses to this entry through the RSS 2.0 feed. Both comments and pings are currently closed. I might try this tonight instead of eating a raw apple. Thank you! By the way, I tried a rice pudding with almond milk. It gives a nice almond kick ! I have to post the recipe now. short and effective presentations always neat! that’s a nifty idea! my lastest obsession is chai tea and I have bags and bags of it around. methinks i’ll give it a go! Dolce, I’m still waiting for your chestnut pancakes! Oooooooh. You just gave me a use for all of those honey crisp apples I bought up from the farm down the road! Never thought of using tea! Love applesauce and I make it often. 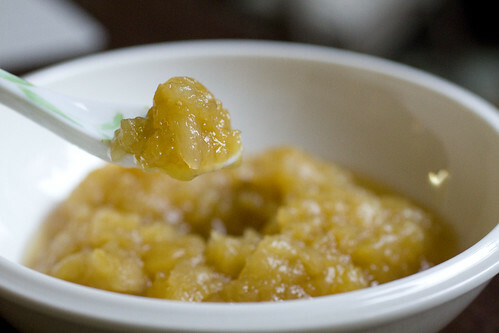 Your homemade applesauce looks sooo good! Invite me over and I’ll bake them for you!!! EMC, I love honey crisps!! Kalyan, you don’t eat fruit? what? Barbara, my friend brought me the little tea pot set from Japan. Everything in Japan is super cute! Dolce, I can’t believe I missed it!! Brilliant. I never had Earl Grey until Captain Picard made me very interested. I love the smell and taste and believe this will be a pleasant addition to my usual dessert. I’m in the mood for Jewish Apple Cake now too. This sounds divine- I love Earl Grey! This is such a great idea! 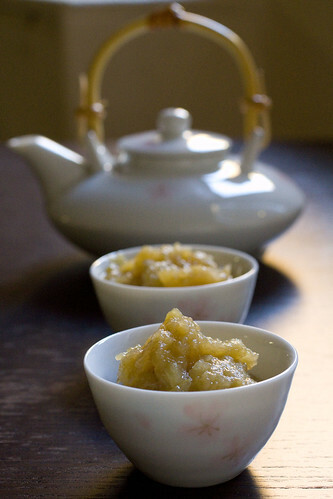 The flavor of tea sounds great in applesauce.